Come See One of New Western Acquisitions Customer Rehabs! Please join us on Tuesday, October 16th at NOON for the Atlanta REIA Onsite Renovation Group (ORG) to learn all about finding, funding, fixing and flipping houses for big profits right here in the metro Atlanta area. This month’s meeting will be held at a new rehab project that is just getting underway at 453 Kendrick Ave SE, Atlanta, GA. This was a New Western Acquisitions deal being renovated by Georgia Residential Partners and managed by Dave Emrich. This property is located in close proximity to desirable Grant Park. It was purchased as a 1008 sqft home with 2 bedrooms and 1 bathroom that was built in 1940. As an added bonus, the property already has a detached garage in the rear of the home. The plan is to build a 400-500 sqft addition on the rear of the home, converting it to a 3 bedroom, 2 bath home with upscale interior finishes. So join us and come see this house as the project begins and join us again later when it is completed! 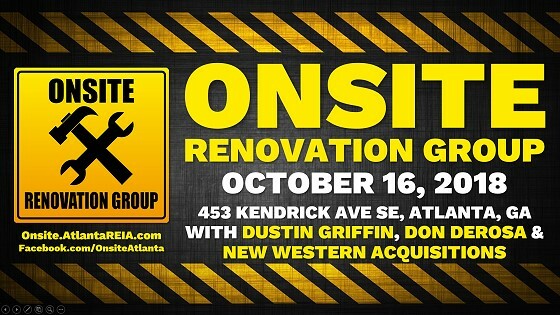 The Atlanta REIA Onsite Renovation Group (ORG) is an educational and networking group led by Dustin Griffin and Don DeRosa that focuses on the acquisition, renovation and retail resale (fix and flip) of single family residential homes. The purpose of the group is to allow both new and experienced rehabbers and investors to meet, network and share knowledge and experience with “hands on” access to real property. Wholesalers, bring your deals! We could be your next buyer! Lenders, bring your money! We could be your next borrower! Agents, Contractors and Other Real Estate Pros, come join us! We could be your next client! The Onsite Renovation Group meets TWICE A MONTH on the 1st and 3rd Tuesday each month at NOON at an active renovation site, build site or rental property which will vary from month to month. As always, there is no charge for Atlanta REIA members to attend. Guests & Non-Members can RSVP Online for Only $15 or pay $20 at the door. Come join us and RSVP Now!